The Episode starts with Purva making the arrangements in the hospital. Vedant looks at her from far and smiles. She collides with a peon and a glass falls down. Vedant comes and teases her. Purva asks if he is scaring her. Vedant says it was a joke. He calls her and thinks I love you. He says everything will be good. Purva thinks hope so. Gomti comes to the hospital with the electrician and asks him to enter just as she signs. Pankhudi hears her and tells Purva that Gomti will ruin the party. Purva asks her to check the sound system. Gomti surprises Purva and tells that Dada ji would have been happy to see her if he was alive. She hugs her and signs mechanic to go inside. Mechanic compromises with the wires. Everyone come for the party. Dadi asks why there is no light. Purva says 1 min and switches on the lights. Dadi appreciates Purva and tells Vedant. Ramesh, Gomti and Sanju come there. Vedant says lets cake the cut. Ramesh asks Gomti if the work is done. Gomti asks him to wait and watch. Vedant says lets cut the cake. Electricity flicker. Purva says she will check. Sanju asks Pankhudi, did you tell Purva about what I told. Pankhudi tries to stop Purva. Purva fixes the light flickering problem. Pankhudi becomes silent. Purva’s saree pallu gets stuck. Vedant takes it out. They smile. Purva asks him to light the Diya. Ramesh says Sanju will light the diya as he is the real grand son. Purva says she kept twp diyas for Sanju and Vedant. Later she announces the game. Everyone plays the game. Dadi signs the song. Purva plays music and stops. Sanju turn comes. He asks Pankhudi for a dance, but she refuses. Purva asks her to dance. They dance. Next comes Gomti…Gomti reads the chit and says she has to tell the secret. She says we will dance first and then I will tell my deep secret. Gomti recalls mechanic sayings and takes out the wires from the music system with whom he had compromised with. She takes out the wire and keeps on floor. Purva sees the wires on floor and is about to plug them, but Pankhudi comes and pushes Purva and takes wire from her hand and gets electric current. They all get worried. Vedant checks Pankhudi who pretends to be unconscious. She hugs him and thinks she has to do this, so that she can make place in his heart and Purva don’t doubt on her. Dadi comes and is thankful to God as she is fine. Pankhudi lies that she saw the naked wires and that’s why tried to stop Purva. Gomti asks Ramesh how did Pankhudi come to know about their plan. Vedant comes and blames them for trying to make Purva get short circuit. Ramesh defends himself and scolds Vedant. Vedant says enquiry will be going on. Dadi says he can’t do this. Ramesh scolds Vedant again. Vedant asks Pankhudi to sleep. Purva thanks her and he says that he has deposited the thanks and became lakhpati. Pankhudi asks Purva which side, he sleeps. Purva asks her to sleep. Pankhudi asks do you love him? Purva says no, I don’t. Pankhudi thinks to free her from her unwanted relation. Purva tells vedant that she got the job from the event management company. Vedant gets tensed. She gets a courier. Ramesh sees it and scolds Purva. Purva argues. Ramesh tries to slap her, but she holds his hand. 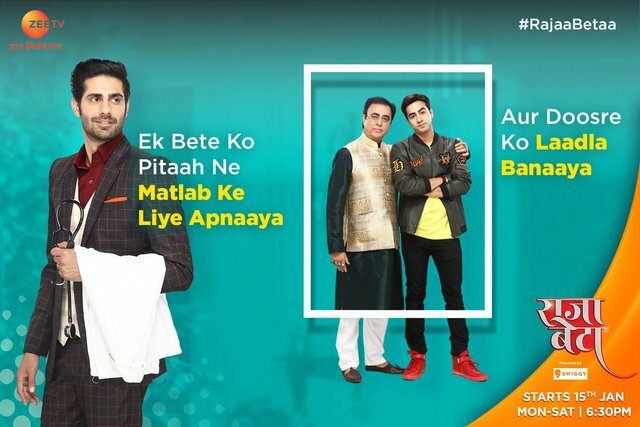 The post Raja Beta 22nd February 2019 Written Episode Update: Pankhudi saves Purva from electric shock appeared first on Telly Updates.